for this very informative article! Photos are located at the bottom of this page. First remove the steam boiler or the diesel, the caboose body, or passenger body. Find the positive or center rail wire from the pick up in the type of train item you are going to install the LED. Generally from the original bulb sockets, you can cut the wire or wires and skin off some of the insulation, reattach these wires and then wire your Red LED wire to this connection and the other LED wire to the ground. I place the LED behind the Lens of the model train steam or diesel engine as a Headlight by using small strips of Duct Tape (I do this so it is easier ). On an F3 Diesel, I do not remove the original bulb as it is used for the cab lighting. In this case I use the bright LED as a headlight to emit bright light from the front lens. Or, you can just remove the bulb from the socket and leave the socket empty, your choice. get a drill bit the same diameter as the LED globe and drill a hole where you want to place the 3mm LED from the inside of the cab. Place the 3mm LED through this hole until it just protrudes out through the hole as you desire it. Place a small piece of duct tape on the back of the LED, to hold it in place. Do this to both sides of the body. Wire both colored wires: Red to all red and black to all black together. Then attach the red wires to the center rail pick up power wire. You can either place electrical tape or heat shrink, or even a wire nut over the twisted wires to avoid a short. I use heat shrink. Then solder all the black wires to a ground. You may want to use longer wire, depending on the location of either the power wire from the center rail or the ground wire. A good suggestion is to go to radio Shack and buy small 2 prong plugs both male and female. Place the plug with the appropriate wires to the two plug connectors. This is in the event you may want to remove the bodies later for repairs. you want to drill a hole the same size as the globe of the flashing LED in the rear of the caboose of passenger car placement of this LED is your choice. Again, place the globe of the 5mm flasher through the hole and place a small piece of duct tape to hold it in place. Attach the red wire to all of the red wires and the black wire to the all black wires then place electrical tape, heat shrink, or the wire nut over the group of red wires. I generally do this to the black wires as well. After you feel you are pretty well finished with the installation of the LED's, get some small plastic wire ties and tie all the wires together. This makes the job look finished and neat. If you wish brighter lighting from the larger 5mm LED's as interior lighting in cabooses or passenger cars, just sand off the top of the LED's. The Evan Designs LED's seem to last forever. The time and design of the components put into these LED's is very satisfying and easy to work with. We have been testing these LED's using varying types of power. Our test is still going on and we started in the fall of 2006. We have continuous power to the test board we have these LED's mounted to and none have burned out. multitude of uses for these LED's. Just try it and go for it. You will be pleased with your work, and you may come up with your own method of installation, maybe even simpler. Again,go for it! A small tip: After you are finished and satisfied with your work, I advise you not to look directly into the brightness of the LED's as they are very bright! Again, a big thank-you to Jerry for this great article! 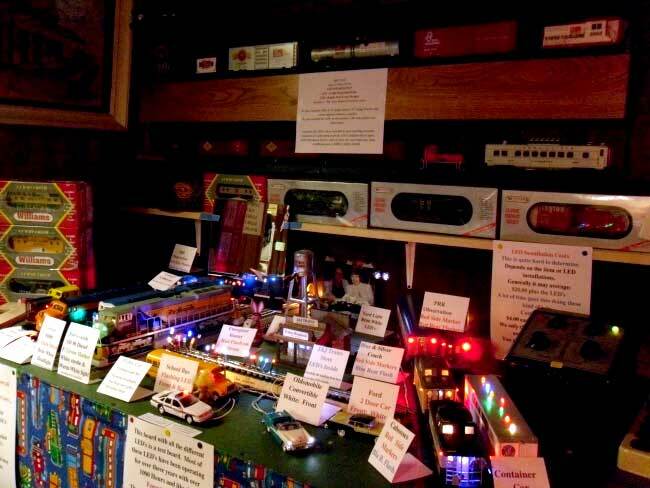 Jerry has a Train Hospital in Pennsylvania and has been repairing trains for 50 years or so! You can contact Jerry with questions about your specific train. Jerry also does custom LED installations. as well as many hundreds of others. The Universal Lights are used for all of these projects, they are suitable for AC and DCC and DC track power. CLICK on any photo below to see a larger view!